In 2003, Erica Rebollar created a modern dance collaborative where multi-genre artists can make innovative work. RebollarDance examines dichotomies and fragmentations of physical behavior that explore boundaries of performance, using bodies, light, and sound as conceptual canvasses to evoke authentic, highly charged experiences for both dancers and audience. Rebollar Dance’s mission is to create and present cutting edge choreography that impact large and diverse audiences, examining movement as a facet of modern life and a laboratory for analyzing themes. Exploring choreography as innovation, RebollarDance promotes an artistic process of challenge and risk-taking. Born in Los Angeles, raised In New York City, and currently based in Washington DC, RebollarDance has to its credit over 85 performances in more than 40 venues nationally in Los Angeles, Seattle, San Francisco, New York City, Salt Lake City, Washington DC and internationally in London, Paris, Stockholm, Frankfurt, Hamburg, and throughout Indonesia. With a steady stream of performances in traditional venues and site-specific locations, the company has reached thousands of individuals. RebollarDance draws together the unique backgrounds and talents of Choreographer Erica Rebollar, dancer/choreographers Ronya Lee Anderson, Amanda Blythe, Heather Doyle, Samual Horning, Kjersten Lynse, Althea Skinner, and Katie Sopoci Drake. Their training in modern dance, ballet and contemporary movement styles such as Butoh, somatic practices, and release technique fuse with backgrounds in theatre and martial arts. The amalgamation of these trainings is a primal yet precise style of movement rooted in technique. Weaving textural guitar loops, soulful melodies and grounded rhythms into tapestries of sound, composers Charlie Campagna and Jeffrey Dorfman compose and perform music for RebollarDance performances and workshops. RebollarDance has four current “tourable” full-length productions: “Sacred Profane”, “GOODHURT“, “Space Junk“, and “Tinsel and Bone.” Each work melds the many artistic facets of RebollarDance: contemporary dance, installation/costume/set design, video installation, text and original music by Charlie Campagna and Jeffrey Dorfman. Cyborg Suites is a 30-minute work that imagines post-humanism with dancing cyborgs. Inspired by Donna Haraway’s “Cyborg Manifesto”, Cyborg Suites examines movement boundaries between machine and human, automatic and sensory, internal and external. With an original sound score from DC composer Jeffrey Dorfman and 4 women dancers, Rebollar highlights physicality in its visceral and mechanical aspects, while challenging ideas of performance and identity within public/private spaces. Enjoying site specific work, RebollarDance has performed throughout Italy as part of Europe’s “Civitanova Marche Intl. Dance Festival” site-specific Dance Festival; at Navy Yards Park, DC in a collaboration of over 60 performers with Force/Collision theater company presenting Nautical Yards; in various DC locations through Dance Place’s “Arts on 8th” outdoor performance series; and at Malcolm X Park, DC and Arlington Arts Center, VA. RebollarDance offers performances in inspiring natural, industrial, and indoor settings to create provocative installation and mixed media work. Los Angeles Dance Resource Center/ Lester Horton Dance Award nominee for choreography: The Lights From the Heavens Are alled Stars, Japan American Theatre, CA. I make work that po ses a series of questions. The process of questioning, unraveling meaning, and exploring answers is why I work. Choreography is my opportunity to connect in a meaningful way with audiences and myself. Using sound and dance as conceptual canvasses, I work to create an authentic, highly charged experience. I seek to communicate and to create an initial, human bond. The best surprises are in small ways, original ways of thinking. I seek innovation and open behavior to impact my audiences intimately, immediately. I choreograph movement about themes of conflict without attempting to heal the polarity between thought and action. I am curious as to how minor and seemingly random events and encounters can create a powerful inclusive narrative. I weave vignettes together to serve as layered information toward a complex whole. The discreet battles within movement, sound and memory excite my processes. Rather than tell a thematic tale, I form multi-layered works that deal with problem solving. In this way I seek to guide viewers and myself through a challenge of multifaceted knots. My dance seeks to heighten the commonplace events of subtle and restrained interactions in public and private spaces, individually and socially. I like to evoke a sense of the profound in the mundane, a sense of hope in futility, and the richness of empty space. • Christopher J. Mackie, Ph.D.
Place of No Tears, Solo Dance Festival, Jakarta, Indonesia; Makassar Arts Forum, Ujungpandang, Sulawesi; TUK Theater, Jakarta; STSI Pendopo, Solo, Java. Land Of Thin Dimes, Second Journey Company, – solo performance Indonesian Dance Festival, Jakarta, Indonesia; Makassar Arts Forum, Ujungpandang, Sulawesi; TUK Theater, Jakarta; STSI Pendopo, Solo, Java; Solo Festival 2000. Inconclusive Blooming – collaboration with Eko Supriyanto, 1999 APPEX Salon, UCLA, Los Angeles; Broadway Performance Hall, Seattle; Highways Performance Space, LA; Forum Kerja Koreografer 2000, Bali, Indonesia and Riau Dance Forum, Sumatra, Indonesia. 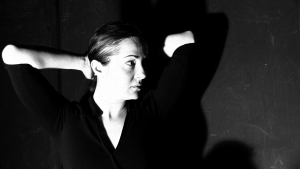 ERICA REBOLLAR (Artistic Director/Choreographer/Workshop Facilitator) was born in Madrid, began studies at Washington School of Ballet, and completed her MFA in choreography at UCLA. With the founding of RebollarDance in 2003, Erica Rebollar created a modern dance collaborative where multi-genre artists can make innovative work. RebollarDance examines dichotomies and fragmentations of physical behavior that explore boundaries of performance, using bodies, light and sound as conceptual canvasses to evoke authentic, highly charged experiences for both dancers and audience. Rebollar was a 3-time Lester Horton Award nominee in Los Angeles. Awarded the prestigious Mabou Mines Suites residency program in NYC, Erica showed works at PS 122 and St. Mark’s Church. She was a recipient of Joyce Soho’s A.W.A.R.D show, performing at Judson Church, DTW (NY Live Arts), DNA, TPAC, and the Flea. Upon relocating to DC, RebollarDance has received funding from the Art Council of Fairfax County, Kennedy Center’s LDCP grant, Culture DC’s Mead Theatre Lab Program/CityDance at Strathmore, and space grants from American Dance Institute and Dance Place. The company has performed numerous evenings at Dance Place, VelocityDC/ Harman Hall/Shakespeare Theatre, Kennedy Center’s Millennium Stage, ADI, Atlas, Roundhouse, and Jack Guidone Theaters. Nominated for two Dance Metro DC Awards, RebollarDance has been twice highlighted as a Season Pick in City Paper and Washington Post with features on WAMU radio, FOX 5, and NBC news shows, along with a feature in the “Arts and Power” issue of DC Magazine/Modern Luxury. Hailed as “exactly what the District needs”, RebollarDance received a 2013 Dance Metro DC Award for “Excellence in Choreography”. RebollarDance is the current awardee of Fairfax County Art Council’s Operating Support Grant and Dance Place’s Space Grant for her recent creation of “Sacred Profane”, to be toured through the National Performance Network. Erica is currently Visiting Artist in the Department of Dance at UMBC and the 2016 awardee of the prestigious Pola Nirenska Award for Outstanding Contributions to Dance. Heinz Adjakwah began his dance career taking technique classes in his senior year of high school and upon graduation; he enrolled at Morgan State University, where he majored in Nursing. He became a company member of the Morgan State Modern Dance Ensemble under the directorialship of Dr. Iantha Tucker and was awarded the Dorothy .P. Stanley Scholarship the spring of his freshman year. This gave him the opportunity to participate in a summer intensive in Atlanta, Georgia with the Atlanta Dance Connection Dance Company.After being at Morgan State University and with the Modern Dance Ensemble for two years, he transferred to the University of Maryland, Baltimore County and graduated in December 2015 with a dual degree in Dance and Health Administration and Public Policy. He recently performed at the Kennedy Center in Washington D.C during the National College Dance Festival which featured him in a duet choreography that received the Outstanding Student Choreography Award from the American College Dance Association Conference and Dance Magazine.His choreography was also presented at the American College Dance Association 2015 and has performed with Baltimore Dance Project and Howard County Ballet in Maryland. Adjakwah has also been a recipient of the Summer Dance Study Award at the University of Maryland Baltimore County and gained an internship position at the renowned Jacob’s Pillow Dance Festival the summer of 2015 where he took classes taught by distinguished choreographers like Kyle Abraham, Eric Gauthier and dance companies such as BODYTRAFFIC, Jessica Lang Dance, Gauthier Dance, La Otra Orilla, MADBOOTS Dance and many others. As time progresses Adjakwah aims to use his gift to inspire and change lives through performances and teaching. Amanda Blythe was born in California, grew up in Pennsylvania and is now based in Washington, DC. Classically trained in ballet, she dove into the world of modern dance after high school and has never turned back. Amanda works in the DC arts community, both on stage and behind the scenes. When she’s not dancing with Erica Rebollar/Rebollar Dance, she works with Nancy Havlik’s Dance Performance Group and UpRooted Dance as a company member, as well as personal choreographic projects. She earned a BA in dance, studying with Chris Aiken, Peter DiMuro, Meredith Lyons, Ruth Andrien, Colleen Thomas, Ishmael Houston-Jones, Tania Isaacs, Nicole Wolcott and many others. Heather Doyle is an artist and activist from the mountain south now living and working primarily in the mid-Atlantic. Her recent creative projects include dancing with RebollarDance for several seasons, and performing with Katie Sopoci Drake, Stephanie Miracle, and Human Landscape Dance. Other notable projects include dancing with mansurdance, PEARSONWIDRIG DANCETHEATER, Andary Dance, and Tzveta Kassabova. Heather offers deep gratitude for the creative work she shared with Niki Juralewicz, the Informall Theater Company, and the John Gamble Dance Theater in North Carolina. Her choreography has been presented in Movement Research’s Open Performance series, the North Carolina Dance Project, the Greensboro Fringe Festival, District Calling, Dance is the Answer, and the Dinner Party. In 2009, Heather produced tributaries, a concert gathering dance artists from NY, NC and DC during Artomatic. She practices GYROTONIC and GYROKINESIS. Heather has extensive experience in dance production, and supports emerging performing artists as a production stage manager and theater technician. Kjerstin Lysne Palasthy is a lifelong student of the Body. She began her dance training with Ballet in her childhood home of Fargo, before studying Contemporary Dance at Trinity Laban Conservatoire of Music and Dance in London and University of North Carolina, School of the Arts, from which she graduated in 2008. She spent the following two seasons performing for, and teaching, kids throughout the Southeastern United States as a member of the children’s theater company, Open Dream Ensemble. She worked with several choreographers in Washington, DC, from 2010 to 2013, where and when she also experimented with collaboratively creating with follow dance and theater artists. Also during this time, she completed her yoga teacher training and began guiding classes. Her evolution as an artist was greatly impacted by her emigration to Belgium in 2014, where she first encountered Body Mind Centering and a community of artists that have expanded her perception of the potentials of a dance, or movement-based, artistic practice. Althea Skinner is a member of Rebollar Dance. She has premiered in solos by Deb Riley and Vladamir Angelov, and performed in Roxie Doniphan Thomas’ Unhinged at the Kennedy Center’s Millenium Stage. She has also performed as a guest artist with DancEthos, the Eureka! Dance Festival and ClancyWorks. As Althea departs for Brazil to work with the World Wildlife Fund, she is especially grateful to the DC dance community for these opportunities. In the coming years, Althea is excited to dance in Brasilia and serve as the Representative to Brazil for the International Consortium for Advancement in Choreography. Katie C. Sopoci Drake, MFA, GL-CMA, is a professional dancer, choreographer and teacher specializing in Laban-based contemporary dance. Her movement musings come from flora, fauna and fiction and as a classically trained vocalist, she never shies away from the use of the human voice in her productions. Currently a core member of Mountain Empire Performance Collective (MEPC) and a company member of Rebollar Dance, past company credits include Mordine and Company Dance Theater of Chicago (2012-2013), Momentum Dance Company of Miami (2009-2012), Wild Space Dance Company of Milwaukee (2005-2009), and Rosy Simas Danse of Minneapolis (2001-2005). Katie has also made appearances with Clancyworks, Core Project, Brazz Dance, Your Mother Dances, The Florentine Opera, The Minnesota Opera and many more. Her critically acclaimed choreography has been performed across the country by many of the companies and colleges she has been with and her works have been performed on stages such as The Colony Theater in Miami, The Southern Theater of Minneapolis, The Milwaukee Art Museum, and the Smithsonian’s National Portrait Gallery in Washington D.C. Katie has been on faculty at the University of Maryland – College Park, The University of Wisconsin – Milwaukee, Nova Southeastern University, Miami Dade College-Wolfson, Miami Dade College-Kendall, Carthage College, and Lawrence University. Katie’s own work in Laban Movement Analysis has been presented at the National Dance Education Conference 2015 and the Bill Evans International Conference on Somatics-Based Dance Education 2015; her work with MEPC in long-distance collaboration has been presented at the National Dance Education Conference 2015. Sam Horning is a dancer, educator, and dance maker currently based in Washington, DC. As an artist, his choreographic mind has been heavily influenced by the quotidian and poetic spectrums of dance. He values everyday experiences and archival knowledge, mining both for the inspiration, materials, and compositional structures that become the textures of his dancing. Sam relies on efficiency and chance encounters as a means of movement invention. His work is produced from detailed improvisation techniques and is rooted by the information the body can receive from the floor. Sam is a recent graduate from Wayne State University with a BFA in dance. During his undergrad career, he had the immense pleasure of studying with Biba Bell, Nicholas Leichter, Meg Paul, Jeffrey Rebudal, Addison O’Day, Ariel Osterweis, Sean Hoskins, and other WSU faculty whom have greatly influenced his artistic choices. While on academic and talent scholarship, Sam was the personal assistant to the Associate Professor and Area Head–Dance, Jeffrey Rebudal and was simultaneously the President of WSU Dance Workshop in his senior year. Sam was featured in The Michigan Opera Theatre’s production of The Merry Widow in spring of 2015 and was also a member of Artlab J dance in Detroit. He has had the honor of performing in several traditional and non-traditional spaces, but most notably at the The Kennedy Center, The Joyce, The Detroit Music Hall, the Detroit Opera House, the Detroit Symphony Orchestra, Dequindre Cut in Detroit, and Sogang University in Seoul, South Korea. Sam currently dances for Bowen McCauley Dance and is the Facilities Coordinator at Dance Exchange. Franki Graham holds an M.A. in Dance Performance from the Trinity Laban Conservatoire of Music and Dance in London, England where she graduated with Distinction. Funded as a Leverhulme Scholar, she danced as a member of Transitions Dance Company 2014-2015 under the artistic direction of David Waring, performing and touring original works by choreographers Stefanie Batten-Bland, Ikky Maas and Dog Kennel Hill Project. She holds a B.A. in Dance from UMBC where she was a Linehan Artist Scholar and also earned Education and Honors certificates. She is currently in her third year as dance faculty for the Performing and Visual Arts Magnet Program in Anne Arundel County where she teaches modern dance and directs the student dance company. Graham currently dances with Baltimore Dance Project and Kinetics Dance Theatre. She is thrilled to be dancing her first season with Rebollar Dance. CHARLIE CAMPAGNA (Music Director/Composer/Guitarist) has worked as a composer and musician in Los Angeles since 1989. The Los Angeles Times has praised Charlie for his “transfixing” and “crackling guitar work”. Charlie’s compositions and live playing merge his interests in guitar, percussion, textural sound collage and world music. He has composed and directed music for over 20 evening-length dance productions. He is co-founder of the Sacred Spaces Workshop, where he directs the improvisational music ensemble and plays guitar and cello. He often plays live, incorporating his guitar and live looping/sampling techniques with live percussion, piano, vocals, etc. to create lush sonic soundscapes. Charlie enjoys working in many areas of music, including composing for film, producing, recording, mastering, composing and performing. Charlie contributed guitar work to the films “Don’t Say A Word”, “High Crimes”. He has created music for commercials and films such as “There’s Something About Mary”, “The Wild Side”, and “Phoenix” and has collaborated with composers such as Paul Hasslinger and Graham Revel. Charlie is a mastering engineer with clients such as Savoy Jazz, the late Barry White, James Hood, BMG, DJ Dan, Arista Records and Windham Hill. Ben Levine is Passionate about modern dance and experimental theater, Ben aims to combine his dance and theater training with his knowledge of theater technology to make awesome art. Since 2007, Ben has worked as the Technical Director/Theater Manager of Dance Place in Washington, DC. As Resident Lighting Designer at Dance Place, he has had the opportunity to design for many DC-based and touring dance companies including Wally Cardona, City Dance Ensemble, Tiffany Mills Company, Lionel Popkin, Nejla Yatkin/NY2Dance, Dana Tai Soon Burgess & Co, Rebollar Dance, Dance Box Theater, and EDGEWORKS Dance Theater. Ben holds a degree in Theater Arts and Mathematics from Drew University. He was recently named “Best Up-For-Anything Technical Director” in the Washington City Paper. David Dowling is a videographer/photographer and founder of IsItModern?, which specializes in Dance Video. He especially enjoys capturing unfolding images in nature. He believes that design is the sinew and fiber of a project, and that presentation stems from a simple and direct desire to communicate. David has published a book of children’s poetry, composed and written several short, educational films that have been shown internationally. He currently works in Development at Dance Place Theatre and with Rebollar Dance. Katy Kincade, after many years in the affordable housing field, is launching a second career as a costume designer. She recently finished her studies in the Fiber Department at the Maryland Institute College of Art (MICA). She has done costuming for Tia Nina for their performance at Slutwalk on the Mall in Washington; for the Restoration comedy, The Man of Mode; and for the futuristic Zombie: the American while an intern at the Woolly Mammoth Theatre Company. She likes that range and looks forward to more exciting work ahead. “On Saturday, I saw Erica Rebollar’s piece in the ongoing Mabou Mines RAP presentations. If you recall, I posted about her explorations of amnesia a couple months ago. The piece in full was truly amazing. Not only did her movements and gesture continue to develop into a great dance, but she did awesome things with projection and through collaboration with a composer that really enhanced her work. A few moments that really stood out to me were these gigantic projections of her doing the piece that covered her moving body and the back wall. Since the piece was about the loss and attempt at reconstructing identity this was particularly effective. There was another moment of projection when she lay on the floor with her back arched and her forehead facing the audience when a line of text was projected and ran right over her forehead. You could read it like a news ticker. Since, once again, the piece was about amnesia and the text was a Washington Post story about an amnesiac, this was enormously successful. “Strong steps forward,” Chris Pasles, LA Times, Calendar, June 28, 2003. Victoria Looseleaf, LA Times, Calendar, June 9, 2003. As part of our commitment to women and the environment, RebollarDance offers performances at benefits for non-profit agencies. In this way, we support fund-raising efforts for women’s shelters, women’s rights, women’s health, environmental and animal protection. RebollarDance has been invited to artist residences in Dance Departments at University of Maryland Baltimore County; University of California, Los Angeles; Brigham Young University, Utah; College of the Arts, Solo, Indonesia; and Oakwood Performing Arts High School, Hollywood, CA. Master classes at Towson University, MD; American University, DC; Joy of Motion,DC and other schools and studios. RebollarDance teaches a unique perspective of movement that fuses somatic and technical practices with focus on performativity and gaze practices. RebollarDance is pleased to offer Sacred Space Workshops. Led by Erica Rebollar, these community-based improvisational dance workshops with live music are for people with and without dance training who want to explore the communicative, expressive and joyful aspects of dance.